2003’s “The Room” has been widely heralded as one of the worst films ever made, a screen-splattered mess of bad writing, clumsy direction, incompetent acting and grandiose (and totally unfulfilled) ambitions. All true. But here’s the thing: “The Room” is also wildly entertaining, an extravaganza of unintentional comedy. Which is why over the last decade it has become a cult favorite, beloved by midnight audiences who know every inane line by heart. “The Disaster Artist” is director/star James Franco’s retelling of how “The Room” came to be made, and unlike its source material, this film is intentionally hilarious. Wha we’ve got here is a comic masterpiece inspired by a dramatic monstrosity. “The Disaster Artist” is based on actor Greg Sistero’s memoir of making the film with friend and all-around bizarre human being Tommy Wiseau. The two meet in a San Francisco acting class where Wiseau (James Franco) — a droopy eyed, long-haired wraith with an elusive slavic accent, a malapropism-heavy grasp of English and a borderline creepy personality — stuns his fellow students with a rendition of Marlon Brando’s “Stella!” scene from “A Streetcar Named Desire” that ends with him doing a passable imitation of a grand mal seizure. Sistero (James Franco), whose desire to be an actor is undercut by his unassertive personality, is fascinated by Wiseau, a guy who marches to his own out-of-sync drumbeat — for example, doing high-volume scene readings over breakfast in a crowded restaurant. A sort of sensei/grasshopper relationship develops, and Wiseau invited Sistero to move with him to L.A. where he has an apartment he rarely uses. Neither man has any discernible acting talent, and after weeks of futile auditioning Wiseau decides to go pro-active. He’ll write a script for a movie that he will direct and finance. He and Sistero will star in it. They hire real professionals (Seth Rogen, Paul Scher) for their crew and desperate actors (Ari Graynor, Jacki Weaver, Zac Efron, Josh Hutchinson) for their cast and get to work. At the very least you’ve got to give the makers of “The Vault” props for daring genre blending. The first 45 or so minutes of Dan Bush’s film (he co-wrote it with Conal Byrne) is a fairly standard bank robbery flick. A crew of thugs invade a downtown bank, take the employees and customers hostage, and prepare to loot the place. There’s the usual assortment of big hulking tough guys. But heading up the operation are a couple of women — sisters no less. Leah (Francesca Eastwood, Clint’s daughter) is more or less the cool brains of the outfit. Sister Vee (Tamryn Manning) is a hot-tempered, fly-off-the-handle type (a role she perfected on “Orange is the New Black”). There’s also their brother Michael (Scott Haze), on whose behalf they’re robbing the place. Michael is deep in debt to some very bad guys, so the sisters view this as a rescue mission. 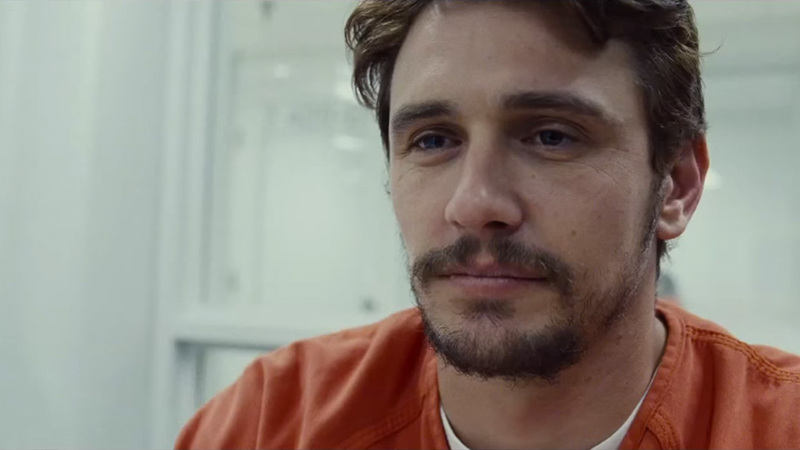 Among the hostages is Ed (James Franco), an assistant bank manager who sports a decades-out-of-style ‘stache and scuzzy sideburns. To save the hostages he lets the robbers know that most of the money is in an old vault down in the cellar. Early on Leah poses as a potential bank employee and is told during her job interview that it’s hard to keep cashiers at this branch because people think it’s haunted. Add to that our growing knowledge that 40 years ago this bank was the site of a robbery-gone-wrong and world-class massacre, and you can sense elements of the supernatural creeping in. Sure enough, once the crooks are down in the basement drilling open an old bank vault weird stuff happens. Electric lights flicker. Turns out there’s more than just cash in the vault. And there you have it. The well-armed tough guys soon find themselves prey to a small army of shadowy figures who’ve spent decades locked up. Now they’re free to wreak havoc. Yep, it’s pretty goofy. At least Bush and his players don’t let on that they know it’s goofy.